ACCI is a manufacture of High Speed Cap Sorters and Systems, Stainless Steel Conveyors and other Specialty Material Handling Equipment, as well as being a systems integrator. Automated Conveyor is the manufacturer of the Automated Portable Conveyor( APC) that is designed for the horticulture industry. The ACCI team has designed, supplied and installed numerous integrated systems for manufacturing and distribution. These satisfied customers include, Pepsi, Coca-Cola, Ball Plastics, General Foods, Random House and Southern Wine and Spirits. ACCI's founder after designing distribution centers for major apparel and retailers retired briefly then, subsequently built beverage equipment for a major supplier in the international beverage industry. After observing the deficiencies in these products it was decided to take the gamble and design his own precision machinery. Since then, ACCI has become a major player in the High Speed beverage packaging arena hiring the most skilled professionals available.Our line includes but is not limited to Empty Bottle Air Conveyor Gaylord and Case Cap Dumping, Cap Sorting, Bin Warming and Custom Chutes of all configirations as well as an infinite supply of bottle/unit conveying designs. ACCI offers a wide array of options for shipping and distribution applications. We take an application specific approach to systems integration. The ACCI engineering team has over 100 years of experience and genuinely enjoy the customer interaction with the goal of achieving a successful installation. ACCI's "APC" division has modeled itself after our friend Frantz Christensen of Chris Industries Conveyors. ACCI has been contacted by several existing Chris Industries "CIC" customers to potentially fill a need for replacement conveyors parts as well as new conveyors. APC was created to have the ability to supply compatible replacement parts for the CIC conveyors and ancillary equipment. We feel that our new APC design is a more durable and suitable for the requirements of the each application. The new APC conveyor as well as the “add on Sections” are compatible with the existing Chris Industries Conveyors currently in use. ACCI "APC" does stock the majority of the parts both for CIC and APC. Overnight shipping is always available. Please call for conveyor/parts availability and pricing. 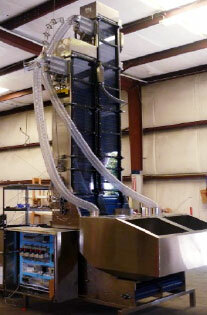 Custom machinery includes multiple types of machines conveying multiple products over an endless supply of applications. Merging,combining, diverting, collating are all operations which ACCI has preengineered designs. Just ask and you will most likely here that ACCI has something "In the can" that will initiate a design for your application. We try to make it as simple as possible for our clients to work with us. By developing a strong relationship with each customer, we hope that they will contact us for any needs that arise. experienced people who truly enjoy their work.